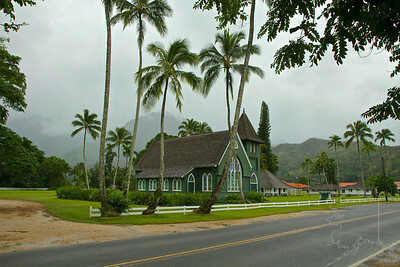 One of the most photographed churches on Kauai. The Wai`oli Mission was established by American Christian Missionaries in 1834. A pole and thatch meeting house was constructed by Hawaiians on the Mission Hall site, in anticipation of the arrival of the missionaries. Following the destruction of two earlier buildings by fire and wind, the congregation completed the timber frame and plaster building in 1841. The lime for the plaster was made from coral which was dug at low tide. The Mission Bell was acquired in 1843, and placed in the belfry behind the Mission Hall. The Mission Hall is the oldest surviving church building on the island of Kaua`i. William and Mary Alexander, the first missionaries to Hanalei, arrived by double canoe from the Waimea Mission. During their nine years here, Mr. Alexander, assisted by George Rowell and Edward Johnson, carried the Gospel to persons along the Northern coastline of Kaua`i. Two years were spent building the Mission House, which was completed in 1837. Mr. Alexander "laid up the chimney" with his own hands, and it stands to this day. Deborah Kapule, the dowager Queen of Kaua`i and an earnest convert, assisted in establishing the Mission. Governor Kaikioewa of Kaua`i provided the land, and encouraged the Mission in many ways. The Mission School was started so that children and adults could read the Bible, which the missionaries translated into Hawaiian. Abner and Lucy Wilcox arrived in 1846 to spend over 20 years as educational missionaries, developing this school, which was a pioneer in vocational training as well. The Wai`oli Mission School was well attended, and trained teachers to go throughout Kaua`i and Ni`ihau. This is now the Hanalei Public School. In 1912 the present Wai`oli Church building was given by three sons of Abner Wilcox: Sam, George, and Albert. This shingled church, built in the American Gothic architectural style, has a belfry tower which houses the old Mission Bell. This bell was rung throughout the years, calling people to worship. In 1921 the Wilcox descendants restored the Mission House and the Mission Hall. The Wai`oli Church grew under the guidance of Hawaiian ministers. 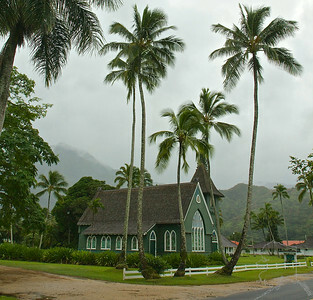 By 1945 the Anini Church and the Haena Church had joined with the Wai`oli Church to form the Wai`oli Hui`ia Church. Having survived two previous hurricanes, Hurricane Dot and Hurricane Iwa, both the Wai`oli Hui`ia Church Sanctuary and the Wai`oli Mission Hall were restored after sustaining significant damage from Hurricane Iniki in 1992. Both buildings are listed on the state and national registers of historic places. The Wai`oli Church Choir is well known for its skill in singing and for its repertoire of early Hawaiian hymns which are sung each Sunday at the 10:00 AM service. The Wai`oli Hui`ia Church has had a continuous record of service since 1834, first as a Congregational Church, and since 1957, as a United Church of Christ.